Keeping up his attack on cow vigilantes, Prime Minister Narendra Modi on Sunday asked people to beware of "fake" cow protectors as they were trying to create tension in the society. 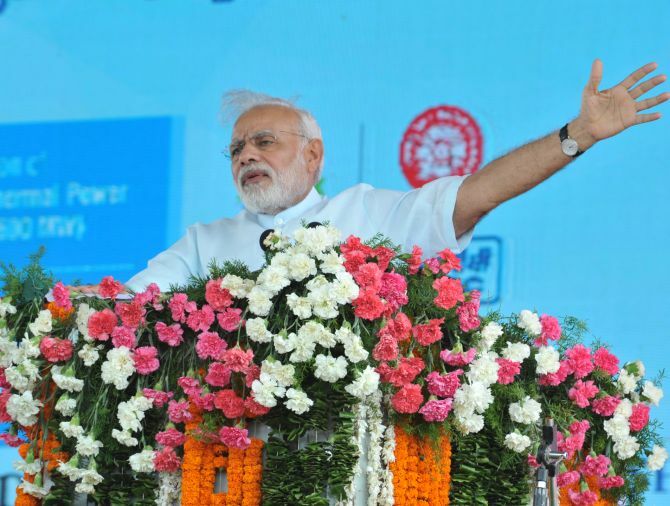 Modi, while addressing a public meeting after inaugurating a host of development projects Gajwel, Telangana, accused the cow vigilantes of trying to create tension in the society and said they should be exposed and punished. "I want to tell everybody beware of these fake cow protectors. These handful of vigilantes have nothing to do with cow protection, but want to create 'tandav' (tension) in the society," Modi said. Describing cattle as country's wealth and not burden, the prime minister made a mention of a Himachal Pradesh Governor's campaign of protecting abandoned cows and handing them over to farmers to use them for agricultural activity. Modi's comments come at a time when his government and the Bharatiya Janata Party are facing flak over incidents of violence against Dalits and Muslims by cow vigilantes in various states including Uttar Pradesh, Gujarat and Madhya Pradesh. This is Modi's maiden visit to Telangana after formation of the state in June 2014.